Reflection has long been used in architecture and design. There are thousands and examples of the use of mirrors on buildings and in landscapes, we’ve chosen a few that we feel are particularly innovative and artful. Two Islands architects designed this Tudor-style house clad in reflective panels on top of a mirrored pedestal, that gives the illusion of it floating in mid-air. Mark’s House is the result of an international competition organised by the Flint Public Art Project in Michigan and tells the story of Mark Hamilton, an imaginary resident of Detroit, who loses the family home through financial foreclosure. The foreclosure of homes and Detroit’s shrinking population has had banks famously, and controversially, leading the demolition of more than 2000 homes, all of which lie dilapidated and abandoned in ageing neighbourhoods. Mark’s House was created as a metaphor for both what the city has lost and its ongoing revitalisation, the gap created by raising the upper house symbolising absence, abandonment but also representing shelter. 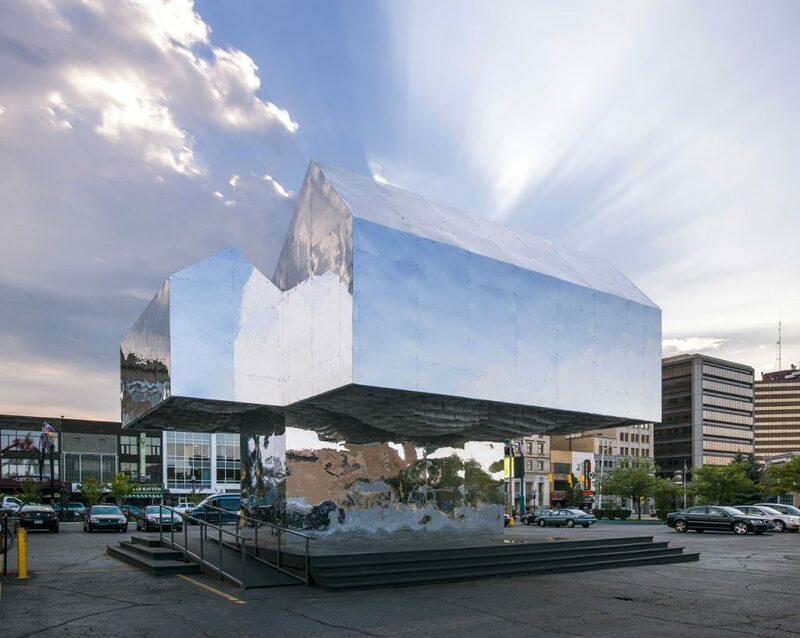 Each year the Flint Public Art Project creates temporary installations to inspire residents to re imagine the city, reclaim vacant and under-utilised buildings and lots. 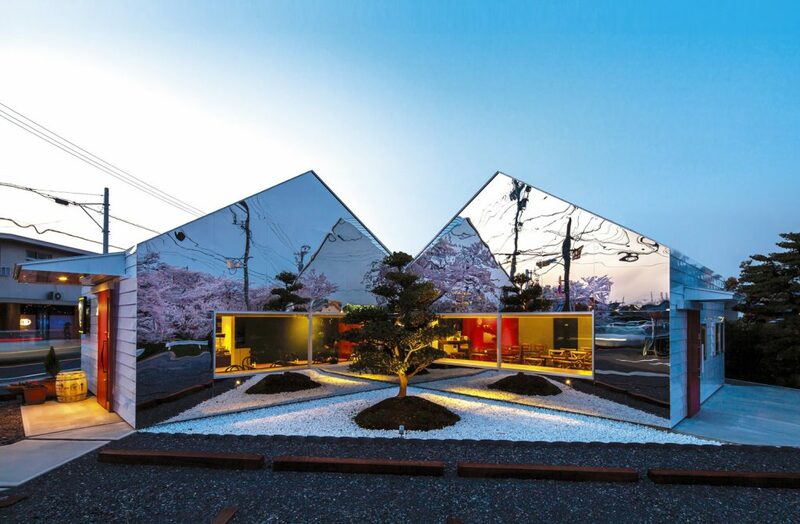 The roadside Mirrors café in Japan, designed by Japanese architect studio Bandesign and clad with polished mirrored surfaces to reflect the building’s residential environment. Situated in the country’s Gifu prefecture, the café is opposite a row of cherry trees, which is a popular destination for visitors during the blossom season. The building’s two gables are made of polished stainless steel and angled towards each other to reflect both the cherry trees and another adjacent tree. Internally the dining areas are organised around two openings that offer views of the arboreal setting through large picture windows, while structurally vertical roof struts take the form of individual branches, allowing guests to feel as if they are able to take refuge underneath the protective tree-like structure. The Azure Window was a 28-metre-tall natural arch on the island of Gozo, Malta — one of the island’s major tourist attractions until it collapsed in stormy weather in 2017. The arch, together with other natural features in the area, has appeared in a number of international films and media productions. This newly proposed development by Svetozar Andreev of Hotei Russia architects, named The Heart of Malta is a polygonal architectural form with mirrored steel faces, which the designer says will have the same size and proportions as the original limestone arch, but with mirrored surfaces to ensure it will blend into the surrounding landscape. Inside Andreev has designed more than 5,000sq m of exhibition space, laid out over five spiral floors with a dynamic laser show in which each spiral step represents one thousand years of Maltese history. The construction aims to be ‘a monument and symbol of the fusion of modernity and nature and a testament to the tenacity of the human spirit’.